Deluge Low Foam Wetting Agent is a non-ionic surfactant for high value crops. Designed for enhanced crop safety. 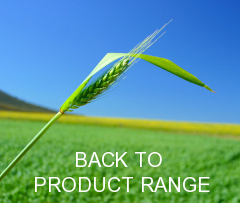 Deluge improves spray results by increasing retention, wetting and uptake of the agrichemicals. It will mix easily with most water qualities used for agricultural spraying. Deluge Low Foam is generally crop-safe when used as directed and therefore well suited to Horticultural applications. 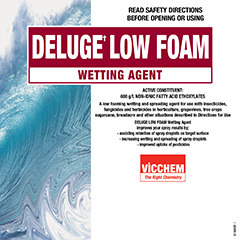 Deluge Low Foam is a low foaming surfactant. Add last to spray tank where it may help reduce foaminess of other products. Deluge Low Foam has been tested for toxicity against a variety of beneficial insects and mites and been found to be amongst the safest non-ionic wetting agent products available. Download the Product Info Sheet for details. Deluge Low Foam has also been tested for phytotoxicity effects in a number of sensitive crops where it has been shown to be amongst the safest of the available wetting agents and similar to the Alkyphenol ethoxylates (eg Vitiwet, Agral*).